Suspect in custody just after 10:00 a.m. on Thursday July 30, 2009. Arlington Heights police officers placed in custody a man associated with a light tan Buick Roadmaster after investigating tips from a report yesterday that a man was impersonating a police officer and speaking with children. The man was questioned near the putting green at the north end of Sunset Meadows Park after a citizen called police to report that the man might have returned to the park Thursday morning. The Buick Roadmaster was similar to a vehicle description provided to police on Wednesday. Arlington Heights police received a report that a heavyset white/male in his 40’s, 5′ 10″ with salt and pepper hair and wearing a white T-shirt and blue jeans identified himself as a police officer to a young boy at the Sunset Meadows Park. Witnesses reported that the man said he needed to talk to other children, used the bathroom at the park, and then left in an older model station wagon with a wood panel appearance and damage to the right front fender. Witnesses or anyone with possible information about this case should call the Arlington Heights Police Department at (847) 368-5300 or call Arlington Heights Crime Stoppers at (847) 590-STOP. Callers are guaranteed anonymity and may qualify for a cash reward of up to $1,000. 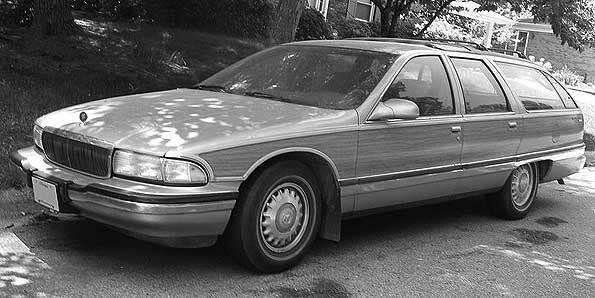 Buick Roadmaster Wagon 1991-1996 model year file photo (possibly similar to vehicle associated with police impersonator suspect).